In a city this size, it stands to reason that the Bars in Christchurch offer a good variety of watering holes to choose from. Sophisticated wine emporia, nostalgic hostelries and plenty of modern, hip bars are 'popping up' every day. Christchurch Bars are doing their best to revive the city's spirits after the 2011 earthquakes. They have instigated a 'pop-up' strategy of re-opening businesses or temporarily re-establishing them elsewhere. New places are opening all the time and much of the city is back to normal. For a good bar crawl, start at the western end of Lichfield Street, where you can stumble into a real ale pub or a trendy cocktail bar. Then head south to Moorhouse Avenue and beyond (known as SoMo), into Addington. This is where many of the post-earthquake pop-ups have materialised, and is buzzing. If you're staying north of the CBD, head to Merivale, around Papanui Road. It used to be a daytime place for corporates to catch lunch, but now it's where the bright and beautiful are basing themselves, until the CBD gets back on its feet. Around the Red Zone, Victoria Street is vibrant, as is Oxford Terrace at the junction with Cambridge Terrace. 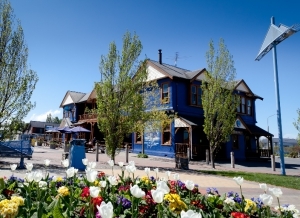 Stop by the Blue Pub in Methven for great food, drinks, entertainment and accommodation right in the centre of town. You can’t miss the appropriately-named Blue Pub?